Ashley Benson in Bionda Castana "Rosario" and Jimmy Choo "Anouk"
Ashley Benson sure knows how to change up her style. The 24-year-old actress attended the PaleyFest panel for ‘Pretty Little Liars’ on March 16 in Los Angeles. Her white Alberta Ferretti dress with a peplum and a ruffled layer gave off a dainty, girly vibe, which was matched by her effortlessly tousled hair. Ashley wore Bionda Castana “Rosario” pumps. The white scallops contrasted perfectly with the black ankle ties, making this design a standout one. The ankle ties added an unexpected yet welcome element to an otherwise simple pair of pumps. Ashley jetted off to New York two days later for the season finale screening of ‘Pretty Little Liars’. Her menswear-inspired look wowed everyone. Taking inspiration from the likes of Angelina Jolie, Ashley wore a full tux consisting of a Paule Ka top, a black jacket, and Alexander Wang cropped black pants. The oversized Saint Laurent bow tie made this look a memorable one. That, coupled with Ashley’s hairdo, gave the outfit a feminine touch. 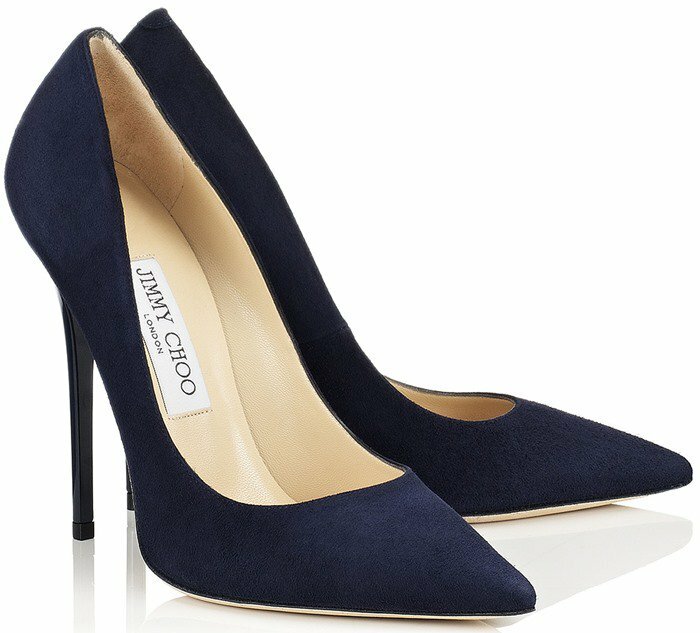 She could have easily gone for black shoes, but Ashley decided to change it up a little with a pair of navy suede Jimmy Choos. The “Anouk” pumps have pointy toes and spike heels, providing extra elegance to Ashley’s masculine suit. What do you think of Ashley’s contrasting looks? Do you prefer her angelic white number, or do you love the mannish outfit?